The row between Korea and the United Arab Emirates (UAE) has been patched up for now, but it is a matter of time before it blows up again, Rep. Kim Jong-dae told The Korea Times Tuesday. 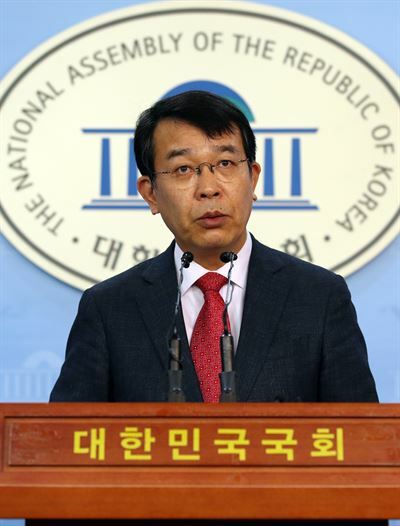 "The two countries have agreed not to disagree for now," the lawmaker from the minor progressive Justice Party said. He said the UAE had its ego stroked as the government sent the presidential chief of staff as envoy and received an envoy from the Middle Eastern country with the highest level of protocols. He wondered what other concessions the government has made to avoid the worst-case scenario. "A short-term fix can't be a solution," he said. The bone of contention is secret defense deals the conservative Lee Myung-bak government allegedly made to win a multi-billion-dollar deal to build nuclear reactors in the UAE. The deals are said to include Korea's automatic support of the UAE in the event of military conflict. That agreement requires the National Assembly's ratification but the Lee government made the deal a secret to bypass due process. Kim said there was no chance of passage even if the deal was submitted, making it possible to assume that the government has made a promise it can't keep or its fence mending was nothing but a stopgap that will be defrayed. "I don't know what the concessions are," he said. Defense Minister Song Young-moo went to the UAE on a fence-mending mission but it didn't work out. "The UAE also put pressure points on Korea, threatening to put SK and GS at a disadvantage in their pursuit of refining facility construction deals," Kim said. That forced the presidential office to act, with chief of staff Lim Jong-seok visiting the UAE on a secret mission. Lim met SK Chairman Chey Tae-won before his trip. The government has not disclosed the contents of dialogue through envoys. Nor did the UAE reveal what upset it in the first place. But the day after the UAE envoy left for home, President Moon Jae-in said in his New Year news conference that the UAE deal could be left open to revisions. Some observers say the UAE has played its card with Korea well to raise its international prestige and gain a leg up in its regional competition with Qatar. But Qatar has close ties with Iran, while UAE is on the side of Saudi Arabia. Iran and Saudi Arabia are two big rival Middle Eastern powers. "We should conduct a parliamentary investigation," Kim said, although the ruling and major opposition parties backed away from the idea.